Fall, 1945 SUN SPOTS Page 4 THE WAR ENDS An Editorial The Second World War is an an end. Just what has been accomplished by victory will be seen in the coming years. The clouds of the War God still hang low over Earth, and the true "peace" has not been as yet achieved. There are still those nations who have not abandoned the dream of future aggression. We have not yet seen the end of wars. * * * If any single factor brought this war to its abrupt climax it was the development of the atomic bomb. This fact is all too evident to be denied. The entry of Russia into the conflict actually meant nothing. It was solely to their gain, and doubtless had little effect on the enemy, who had already seen the destructive force of science's greatest brainchild. The entire affair bears such a striking similarity to so many past science fiction stories that a further discussion is needless. * * * Now the world is turning its multiple eyes to post war plans. And fandom need be no different. One event which was postponed by the war was the 1942 Science Fiction Convention -- The Pacificon. 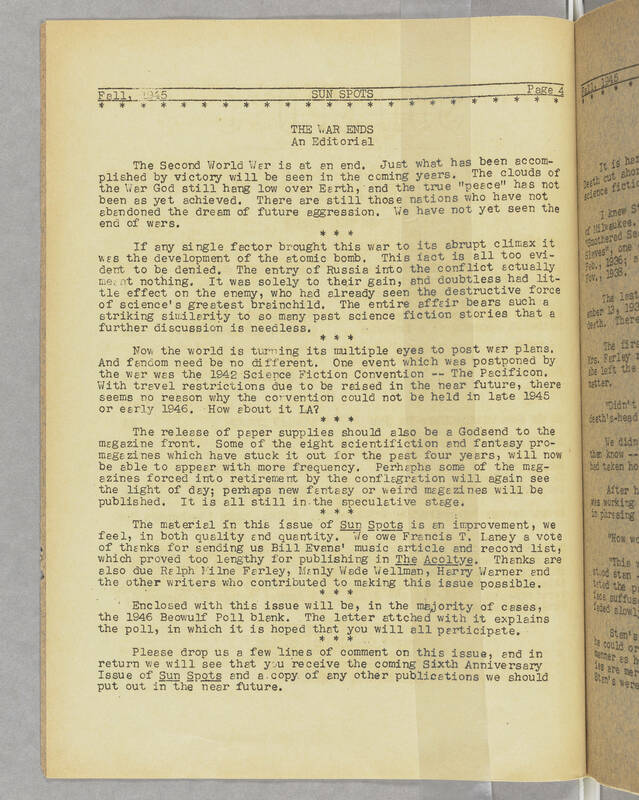 With travel restrictions due to be raised in the near future, there seems no reason why the convention could not be held in late 1945 or early 1946. How about it LA? * * * The release of paper supplies should also be a Godsend to the magazine front. Some of the eight scientifiction and fantasy pro-magazines which have stuck it out for the past four years, will now be able to appear with more frequency. Perhaphs some of the magazines forced into retirement by the conflagration will again see the light of day; perhaps new fantasy or weird magazines will be published. It is all still in the speculative stage. * * * The material in this issue of Sun Spots is an improvement, we feel, in both quality and quantity. We owe Francis T. Laney a vote of thanks for sending us Bill Evans' music article and record list, which proved too lengthy for publishing in The Acolyte. Thanks are also due Ralph Milne Farley, Manly Wade Wellman, Harry Warner and the other writers who contributed to making this issue possible. * * * Enclosed with this issue will be, in the majority of cases, the 1946 Beowulf Poll blank. The letter attached with it explains the poll, in which it is hoped that you will all participate. * * * Please drop us a few lines of comment on this issue, and in return we will see that you receive the coming Sixth Anniversary Issue of Sun Spots and a copy of any other publications we should put out in the near future.